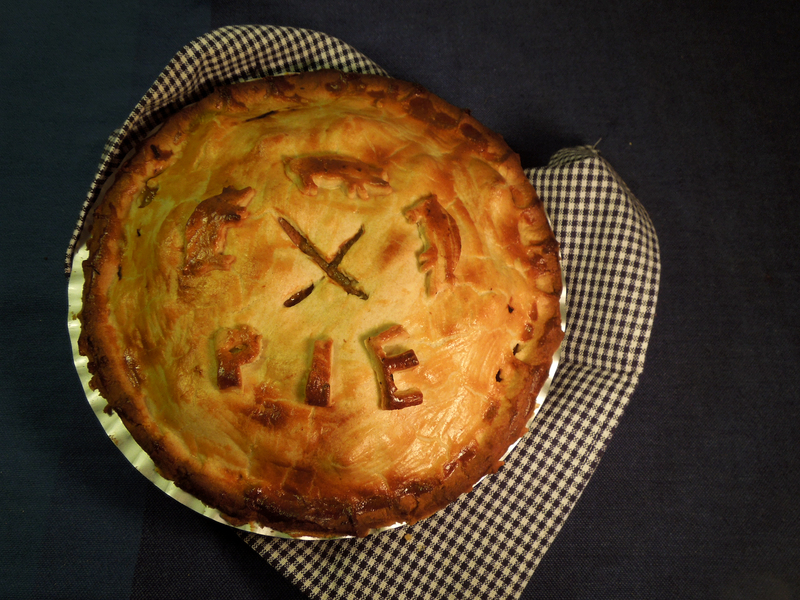 It’s National Pie Week so please allow me to present … Mrs Portly’s Pig Pie. It’s pork shoulder, slow-braised in cider or apple juice, layered with thickly sliced apples and baked in a shortcrust shell. Tangy, meaty and juicy, it’s the sort of pie that gets scrumped from the pantry when your back is turned. Heat a tablespoon of oil in a deep frying pan and brown the meat in batches, taking care not to overcrowd the pan. Scoop onto a plate and set aside. 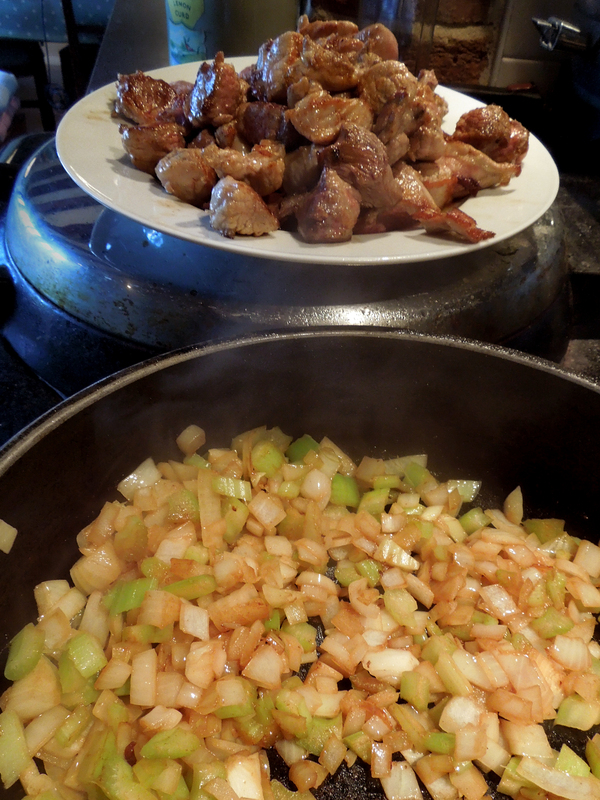 Add a little more oil to the pan and gently fry the onion, celery, leek and garlic until softened, scraping up all the brown bits from the bottom of the pan. Put the meat back in, add the herbs, stock and apple juice and stir well. Season to taste with salt and freshly ground pepper. 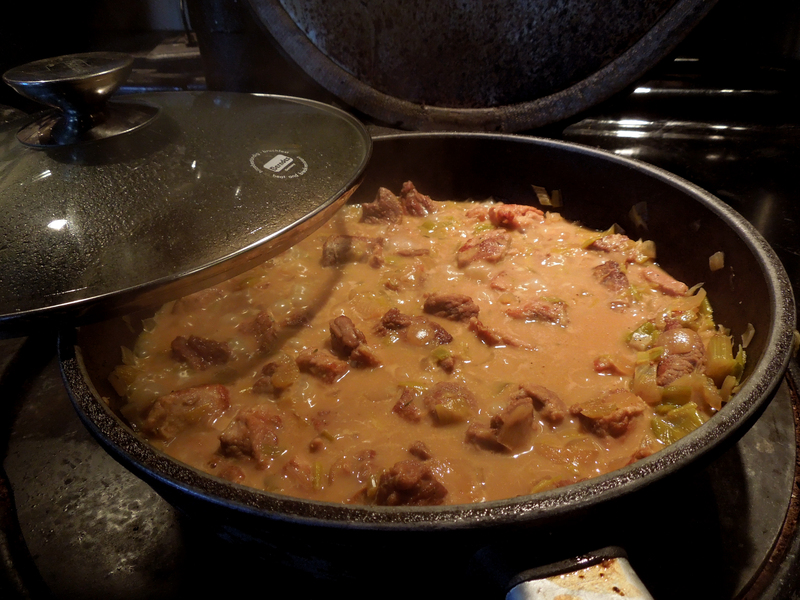 Put a lid on and simmer gently for around an hour, stirring occasionally, until the pork is tender. The liquid should have reduced by now. Thicken it with the cornflour, cook off the floury taste for a few minutes, check the seasoning then set aside to cool. Heat the oven to 200C/400F/Gas Mark 6 and put in a baking sheet to heat up. Take two-thirds of the pastry and roll it out thinly on a floured board to line a 22-24 cm pie tin. Put it in the fridge while you wait for the filling to cool. Spoon half the cooled meat mixture into the pie tin. 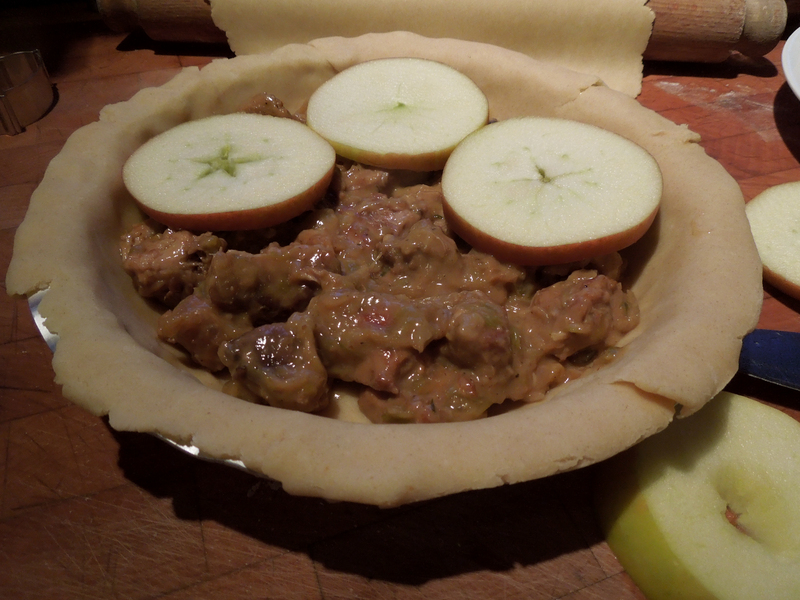 Cut the apple into horizontal slices and arrange on the pie filling, then top with the remaining meat. Egg wash the rim then roll out the remaining pastry and place on top. Crimp the edges to seal and cut a cross in the centre for the steam to escape. Brush with egg wash to glaze and re-roll any pastry scraps to decorate. Place on the baking sheet and bake for 35-40 minutes or until the pastry is golden brown and crisp. Remove from the oven and allow to cool for 10-15 minutes before cutting and serving. 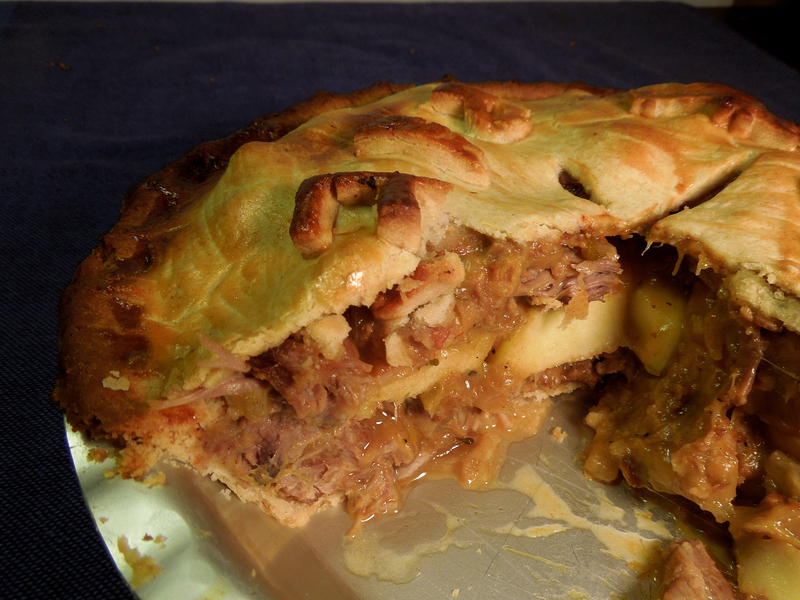 This entry was posted in Mains, Pork, ham and bacon and tagged Mrs Portly's Pig Pie, National Pie Week, pork and apple pie by Linda Duffin. Bookmark the permalink. Awesome pie. I love the idea of National Pie Week. You have done it justice. Thanks Conor. It was National Pig Day on Mar 1 too (who invents these things?) so I think we’ve both done it justice this week – loved your rack of pork. Thanks. You are talking to one of the people behind National Fish and Chips Day BTW! Now that’s a very good cause!